It’s no secret that Big Local is all about building community. Across all 150 Big Local areas, communities have grown, divided communities have pulled them together, and new communities have formed. But there’s another community that has emerged from the Big Local programme. 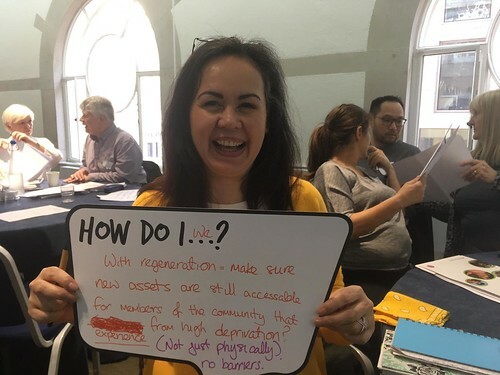 By attending meet ups of other Big Local area’s during Spring Events, joining networking and learning events on specific topics, or those aimed at different partnership roles, (e.g. chairs), Big Locals have been building a community of Big Local areas. Since the start of the programme, conversations between people involved in Big Local have developed into friendships, with areas willingly sharing their experience and travelling increasing distances to visit others. In fact, the Big Local Family has grown and strengthened so much that we've decided to refresh our approach, so that it better reflects where the programme is now. As part of this and starting in 2018, we’ll be looking to foster the skills, enthusiasm and connections between Big Locals in a new way. You might have been to a Learning and Networking event, which have covered a broad range of topics, from digital inclusion to impact measurement. We’ve had some great feedback about these events, but, there's a limit to the amount of information that can be shared in just one day. To address this, we’re going to try a new approach in 2018. If you’re interested in a subject and other Big Locals are too, then you’ll be able to join a Learning Cluster. Once formed, you’ll meet more than once over the year and continue the conversation between sessions. We think leaders will emerge from Learning Clusters that can champion issues in their areas and even take their expertise into new networks. Starting with ‘Better homes’, ‘Building homes’, ‘Addressing youth exploitation and violence within community and criminal groups’ and 'Legacy', we’re going to be asking Big Locals in the New Year if they want to participate. This will mean sharing learning, hearing inspiring stories, motivating one another to build skills and mixing with ‘experts’ that can help take projects to the next level. We’ll also be sharing opportunities to work with other funders through the Clusters. We want to make sure it’s easy to attend these events, and so when you express interest, we’ll speak to you about where you feel comfortable travelling to. We’d like to find a venue that works well for everyone. Ultimately, our new approach will be grounded by feedback from Big Local areas on what is working. We’ll work in an exploratory, experimental and iterative manner to make sure we’re able to adapt to changing needs and connect Big Local areas in best way possible. If you have any ideas for future Learning Clusters please email us.